Employee Income of Aerospace & Defense Industry Cluster | Propel L.A. 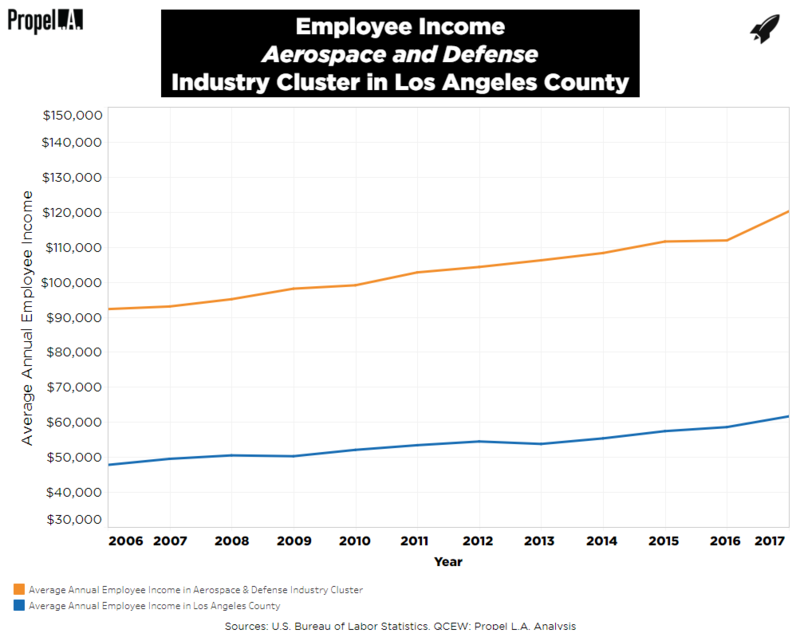 In Los Angeles County, the average worker in the Aerospace & Defense industry cluster (“Aerospace”) makes nearly twice as much as the average worker in any occupation. In addition, the Aerospace industry cluster’s average wage of $120,153 in 2017 is more than four times the 2017 living wage ($28,163) needed for a single individual to cover their basic needs in Los Angeles County. What is the Aerospace & Defense industry cluster? The Aerospace industry cluster is composed of two industries: Aerospace Products and Parts Manufacturing (NAICS 3364) and Search, Detection, Navigation, Guidance, Aeronautical and Nautical System and Instrument Manufacturing (NAICS 334511) per the Institute for Applied Economics at the LAEDC (March 2016). The cluster provides Los Angeles County with “a foundation for the advancement of technology, intellectual property and scientific discovery” (LAEDC, n.d.). For more information about the Aerospace industry cluster, read the LAEDC report here.